Safari browser from Apple which is claimed to be the most innovative and fastest web browser for Mac and Windows, has become a step ahead with the release of Apple Safari 5 browser, with loads of new features and extended support of HTML5. It’s become a browser which lets you browse the web in a better and improved way, and helping developers experience something new and customize their browsing more. Safari Reader – This feature lets you read all the new articles in an ad-free and non-distracting way, with just the story and nothing else being displayed. The reader icon when clicked, would provide you the article in a cluster-free view and the controls also lets you email, print and zoom the articles. And customization like changing the size of the text etc. are also possible. Greater HTML5 Support – Safari 5 supports over a dozen new HTML5 features that allow developers to create interactive content and media experiences that work right in the browser — without the need for third-party plug-ins. The HTML5 video includes fullscreen view, and closed captions. Location services also help you to search around your location. Better Performance – Enhancement in the Nitro engine allows you to browse the web even faster. DNS prefetching and improved caching, will let you open pages faster as they keep getting cached before you click on them. Bing Search – Options for search keeps rising, as Safari 5 has included the Bing search engine in the index. Bing always excels in providing suggestions for your search, and selecting Bing in the Smart Search Field would make you search and get suggestions through Bing search engine. Safari Developer Program – Using web standards, you have an option to customize Safari in your own way and create, use and add extensions to the browser. 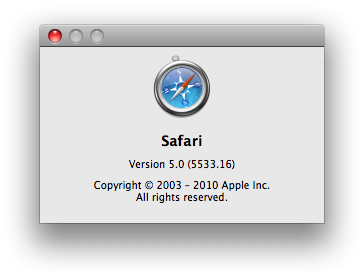 There are many other minute changes and new features added in, which makes Safari 5 a better browser than the other browsers, and also from the previous browser versions. Download from here. And above everything, Safari 5 at least doesn’t have the flash player problems that Google chrome users still keep facing.